Truth, clarity, balanced thought, self-examination, adjustment, cause and effect, responsibility. At the portal of shadow and light, the seen and unseen, Crow holds the gifts of ancient wisdom and sacred law. Her sharp perception brings light to the core of truth. She is able to see that which is fair, and she stands on guard to be sure that such fairness is fulfilled. As a bringer of clarity, Crow will assist you toward spiritual self-awareness. In standing by your personal integrity, you will awaken your authentic self. Balance is a continuous process on the road of adjustment — weigh decisions carefully so as to bring everything back into balance. You are the orchestrator of your life: consider the results of all actions taken, as your actions and thoughts shape your future. 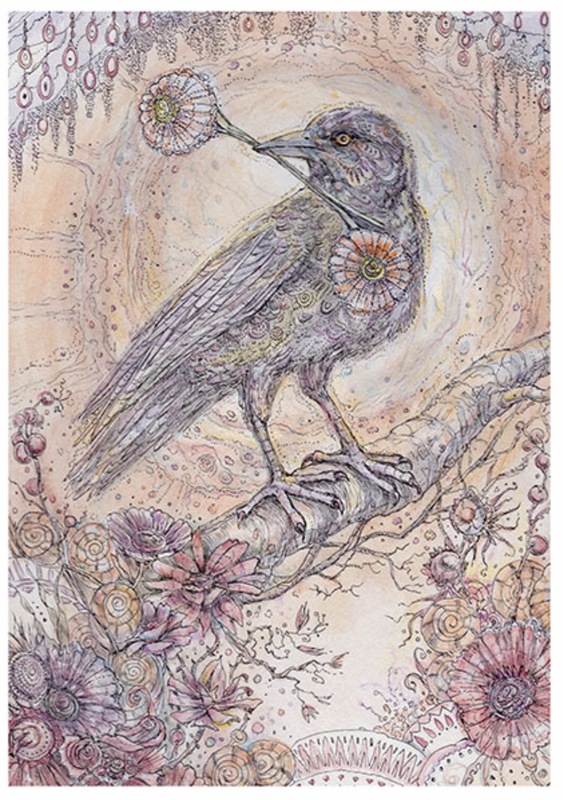 This entry was posted in Artist, Deck Review, Featured Card of the Day, General Tarot, Readings and tagged Crow, Justice, Paulina Cassidy, Spiritsong, Tarot.